Wait for this baby to load and get yourself over to 6:36 to see why former U.S. National Security Adviser Zbigniew Brzezinski made us blow milk though our nose this morning. According to an article in The Huffington Post, hackles are up on several executives over at NBC due to the leak surrounding David Gregory's ascension to the Meet The Press throne. What was most disturbing about this article was the scurrilous accusation that Chuck Todd was in some way responsible for the leak. We here at Viva Chuck Todd found this libelous salvo beyond the pale of belief and responded accordingly by mobilizing our entire editorial staff late last night to get to the bottom of who exactly is responsible for the leak and hopefully inoculate The Chuck from any further blame. Our findings as of this morning were both shocking and disturbing. According to our reporting, it appears that not one, but several people were responsible for the Gregory leak. One of the most surprising aspects of this story is that the leak came not from the news division, but from the entertainment division. Their apparent motive was a complete takeover of the news division paving the way for a revamp where a variety/game-show format would be pursued. According to multiple anonymous sources, the leader of this group was germ-phobe and host of NBC's Deal or No Deal, Howie Mandel. Sources tell us that Mandel has always had an eye on the Sunday morning news show as an excellent vehicle to parlay the success of Deal or No Deal. The Viva Chuck Todd editorial offices have also come into possession of Mandel's notes where he sketched out changing the Meet The Press set to resemble the Deal or No Deal set where political newsmakers would sit before the 26 terraced briefcase-schlepping models and be directed to get their questions by calling on a girl one at a time who would then open the case and read the guest a probing well-researched news question or in some cases a light-hearted general interest question submitted by a viewer. The Mandel notes also revealed that back-channel arrangements had already been made to have former U.N. Ambassador John Bolton be the first guest of the new show along with a whole new round table discussion group consisting of Ben Affleck, Star Jones, Ann Coulter and The Obama Girl. There was also to be a closing musical number planned for each show performed by cross-dressing manazon RuPaul. A musician who had been hired for show's band revealed that the first number was to be a take-off on the RuPaul hit Supermodel where the main chorus lyric "you better work!" was to be aimed towards the incoming Obama administration. Where David Gregory fits into all of this is still unclear, but the same musician who revealed the first closing number told Viva Chuck Todd that Gregory would of most likely been retained after the "coup" for his dancing and comedic talents. Over the years, Gregory has displayed an uncanny flair for R&B interpretive dance and impersonations. While Mandel was the front man for this cadre, the true puppet master was acclaimed West Wing creator, Aaron Sorkin. Sorkin apparently was still harboring ill will towards NBC for the cancellation of Studio 60 on the Sunset Strip and felt that this remaking of Meet The Press would be the right formula of news and entertainment he failed to capture with Studio 60. As of this morning, representatives for Mr. Sorkin were refusing comment and directed our inquiries to their legal counsel. Shortly before press time, NBC released a statement saying that this Sunday's installation of Gregory as the new host of Meet The Press will go ahead as planned. No decisions have been made as to whether charges will be filed against Sorkin and Mandel. 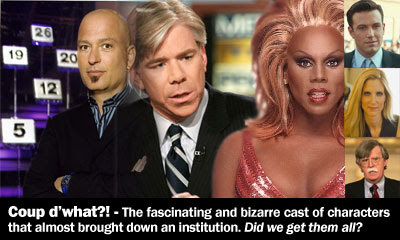 Well, according to Politico.com and The Huffington Post, David Gregory is getting the MTP gig. I'll leave the comments to all of you.